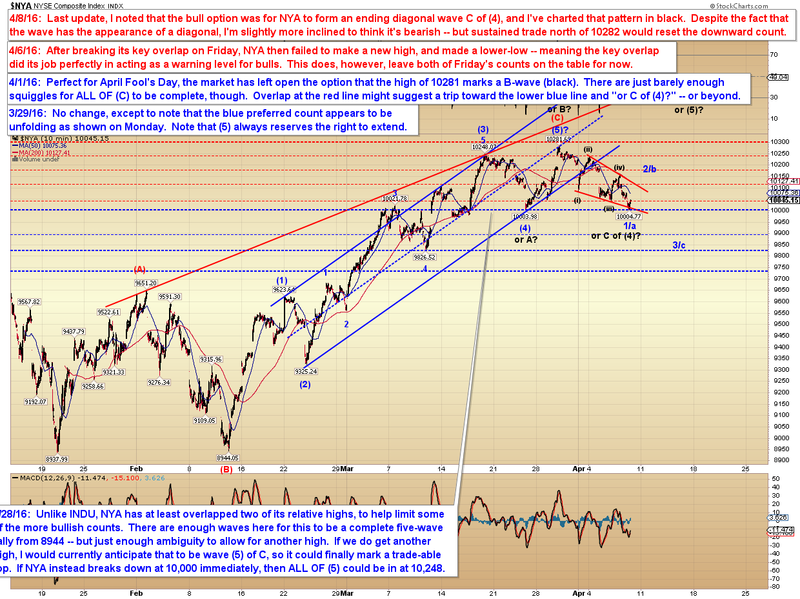 Last update suggested there was "more downside to come," and yesterday indeed saw a second leg down to new lows. 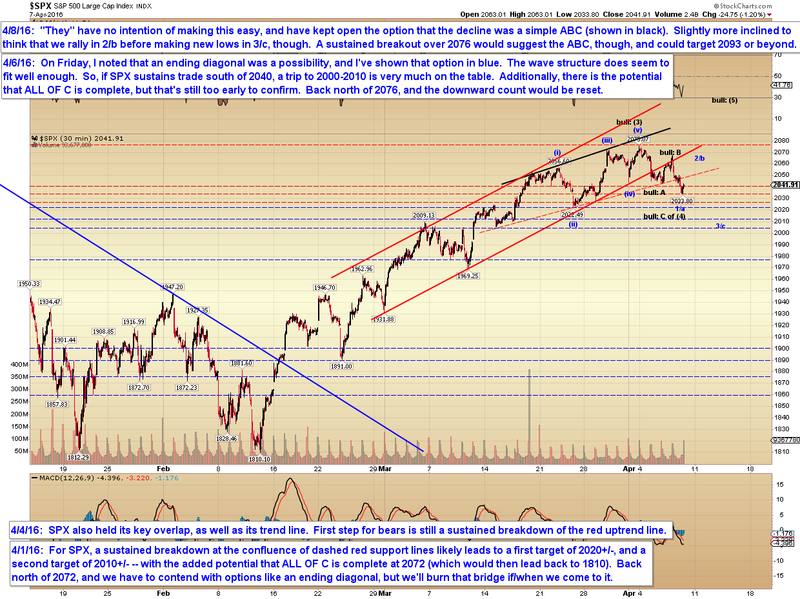 The near-term picture gets a little tricky again now, because, as we'll see on the charts, the market has left itself the option for this to be a completed corrective decline. That said, I'm not inclined to favor that -- although I can't give readers a technical reason for that suspicion. 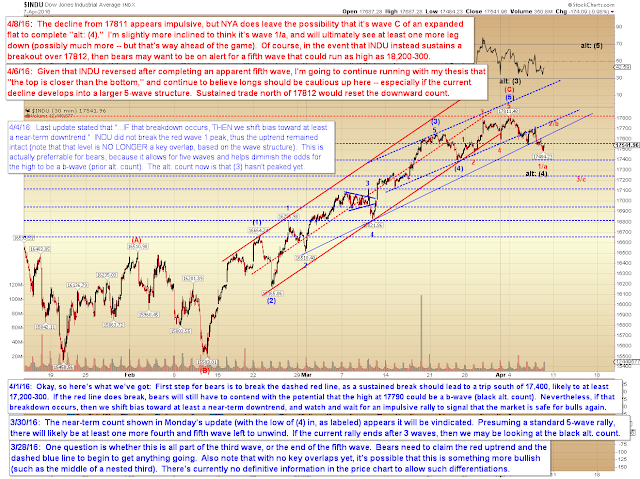 Thus I've outlined the bull and bear options on the upcoming charts, and the levels that reveal which is correct. Let's start with NYA, because it really went out of its way to build itself into the shape of the exact bull pattern that I warned about on Wednesday (an ending diagonal c-wave). The option for a diagonal was revealed by the technical price structure that was already visible as of Tuesday's close, so the fact that NYA went on to seemingly-complete that exact pattern does give me pause for the bear case, but I'm still favoring it unless the market can sustain a breakout. 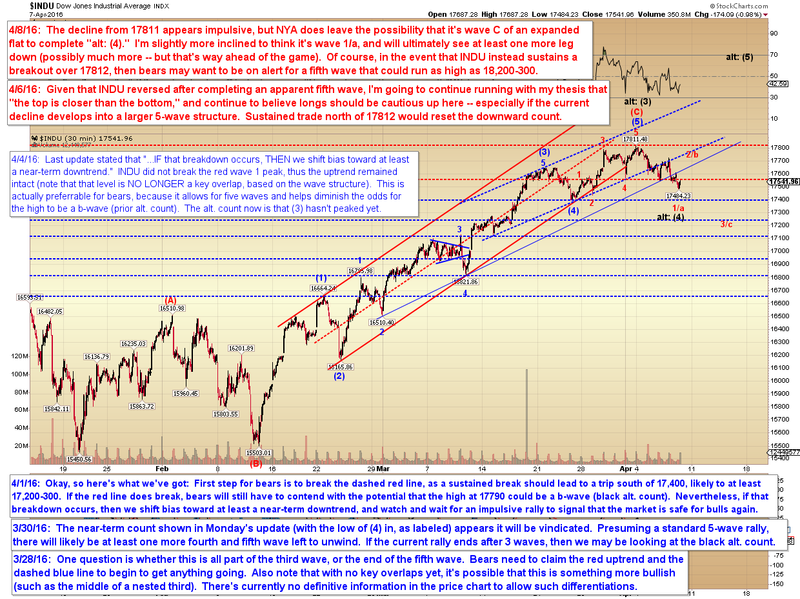 Essentially, even though the market revealed its "diagonal intentions" on Tuesday, then went on to complete that pattern on Wednesday and Thursday, I'm still modestly inclined to believe that pattern is a fake. So: either I'm being stubborn, or my subconscious is picking up on something in the pattern that's tipping the market's hand toward the bears (even though I can't quite put my finger on it)... we'll know soon enough! In conclusion, INDU's decline is impulsive, although NYA shows how that impulsive decline could be a bullish C-wave. 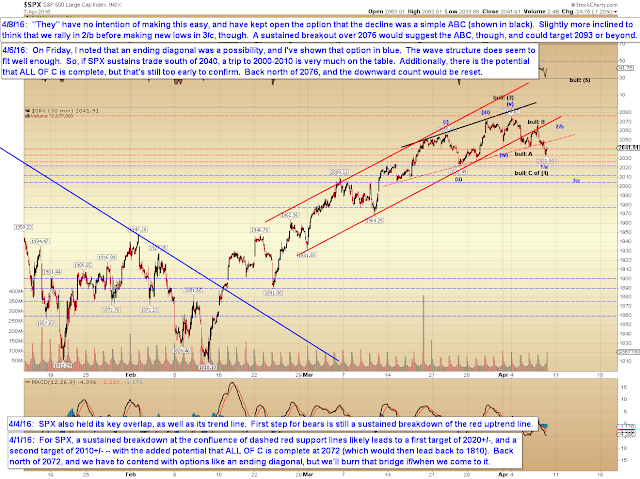 SPX is trying to look like a completed ABC decline. Everything in the pattern is designed to make bulls more bullish and to scare away bears -- but, for whatever reason, I'm not buying it. Maybe I'm wrong, and we'll rally straight on to new highs; this is a very tricky pattern, because it does "look" bullish on the surface -- so, for that reason, I'd suggest only low-risk entries for bears who are inclined to trade against it. Trading, at its essence, boils down to calculated risks, and not all of them will win; thus it's important to consider the other side of the trade, and to keep losses manageable. Trade safe.